Across our country, many people hold an innate fear of elevators. Whether you’re worried about being stuck in one for hours on end or terrified of plummeting to your doom at any second, it’s easy to see why the fear exists. While popular opinion holds strong sway in safety perceptions, it’s important to educate people on the overall safety of riding in an elevator cab. Kohtler Elevators is your source for quality elevator parts across the country, delivering components that perform as great as they look. From your elevator cab interior to the entrances and more, delivering a display that looks and feels professional will help to take the aesthetics of your business to the next level. Today, we’ll discuss a few of the main safety features present on all modern elevators. If you’re in need of commercial elevator components and advice, be sure to reach out to our professionals today! A common fear is that your cab will suddenly unlock and plummet, dropping several stories in mere seconds for a devastating finish. Elevators are not designed to work this way! Cable-driven elevators often use between four and eight cables to move the cab up and down the shaft. Each rope is strong enough to support the cab, delivering an abundance of safety when it comes to weight restrictions. Safeties are in place in the shaft to regulate the speed of the cab. If the ropes were to snap, the sudden increase in speed will activate the safety switches, tripping the lever and applying the brakes immediately. The electromagnetic brakes in your cab also help to maintain smooth operations in addition to safety. Without power, these brakes will stay engaged. While inconvenient in case of an outage, the result is guaranteed safety for passengers. Automatic brakes are now also common at both the top and bottom of the shaft to stop the cab from traveling too far in either direction. 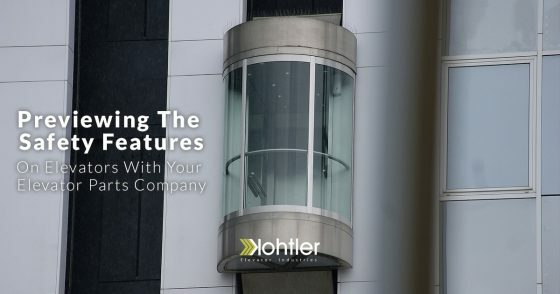 Even if all of the safety checks fail, your elevator system will utilize a shock-absorption system at the bottom to minimize the impact for passengers. These buffers act as a last resort as well as an added safety layer. Being trapped in an elevator cab may sound panic-inducing, yet the modern technology involved helps to minimize your time as a castaway. Sensors in the shaft will help first responders locate exactly where you are in the building. Emergency alarm systems and cab telephones will also help to ensure that you are never stranded by yourself. A latch in the top of most cabs ensures that you’ll have a way to get out if escape is the only option. In all, every aspect of your rescue will be executed perfectly to ensure an optimal outcome if the elevator were to experience issues. While riding in an elevator cab may be stressful, it should be comforting to know that all safety features included work to keep you safe at all costs. The modern elevator has helped to build this country, and its daily popularity makes it an integral part of any large building. Kohtler Elevators is here to provide the best elevator parts and services for our customers. Browse our products online or contact us today to learn about our quality goods.